Christmas will come early for a lot of people this time. Here is a good news to those who will show love this Christmas. Christmas is a season of giving and showing love and the fun part of it is that, it is not everything you want you have to buy. Just by giving a hug with your loved one, you could make this Christmas a worthwhile experience for you and your family. This is because TECNO Mobile is rewarding people with Phantom 8 and a hamper for Christmas. How? You might ask. The #TECNOXmasHugs is happening online and offline. People who upload a picture of them hugging their friends and family and accompany with a creative caption and the hashtag #TECNOXmasHugs stand a chance to be among the 5 lucky weekly winners of Hampers. What is even more interesting is that, if you purchase any of TECNO Smart phones at TECNO authorized outlets, you will be given a raffle ticket which qualifies you to win a TECNO Phantom 8. You can as well win a TECNO hamper when you take a picture with any of the bunny dressed smart ambassadors, post the picture online, make your captions creative and use the hashtags, #TECNOXmasHugs. See how to participate Online and Offline below. 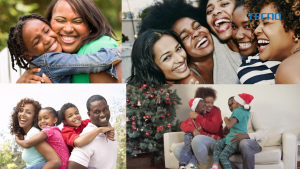 STEP 1 – Take a picture of you hugging your family and friends and accompany it with a captivating caption. STEP 2 – Upload on TECNO’s Facebook page as comment under the activity pinned post with the hashtag #TECNOXmasHugs or on Instagram, Twitter, Snapchat and TECNOSpot with the same hashtag #TECNOXmasHugs. Tag and follow TECNOMobileNG on Facebook, Instagram, Snapchat, and Twitter and TECNOSpot to make your entry valid. These 5 weekly winners will be rewarded with Special TECNO Hampers. Participants from online can as well participate offline for a chance to win TECNO Phantom 8 and branded gift items. 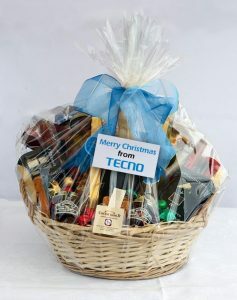 Walk into TECNO authorized store, buy TECNO Smartphone you get an instant gift and raffle ticket. 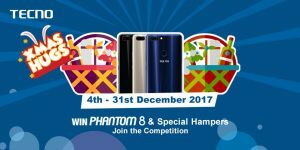 The raffle ticket qualifies you to win a Phantom 8 via a raffle draw, The Smart Ambassador in that store will also get Phantom 8 or the cash equivalent. You also stand another chance of winning Special TECNO Hamper when you take a picture with our Rabbit dressed Smart Ambassador, follow TECNO Mobile on all social media pages and upload the picture on your social Media page with #TECNOXmasHugs. The raffle Draw will take place on the 5th of January, 2018.